We are specialists in multi use games area construction and can build many different types of sports facilities. These multipurpose surfaces are designed to be used with a number of activities to make them more efficient. 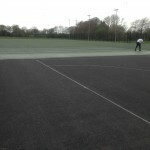 For example a macadam court is perfect for playing tennis, netball and basketball, and a 2G synthetic turf MUGA is suitable for football and hockey. 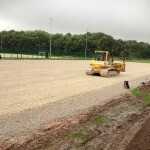 Please enquire with us if you are interested in the costs for installing one of these surfaces at your school or club. We’ll send you over some product information and one of our experts can also explain the installation process in full. 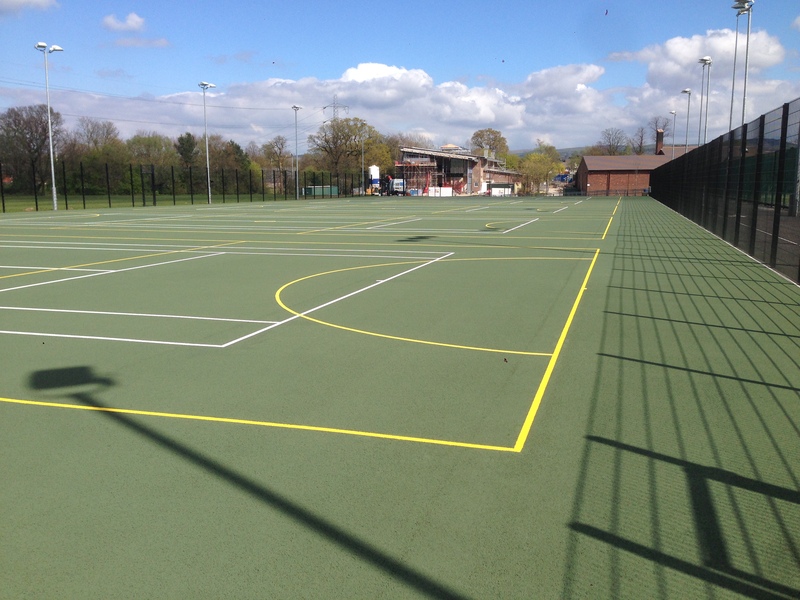 Polymeric Rubber – This is an ideal surfacing option for basketball, tennis and netball as it provides great ball bounce and slip resistance qualities and can be installed in a range of bright colours. Polymeric rubber also has good drainage properties to prevent water build up on the surface, making it an all weather material. Macadam – A low maintenance surface which is porous to allow water to drain through. 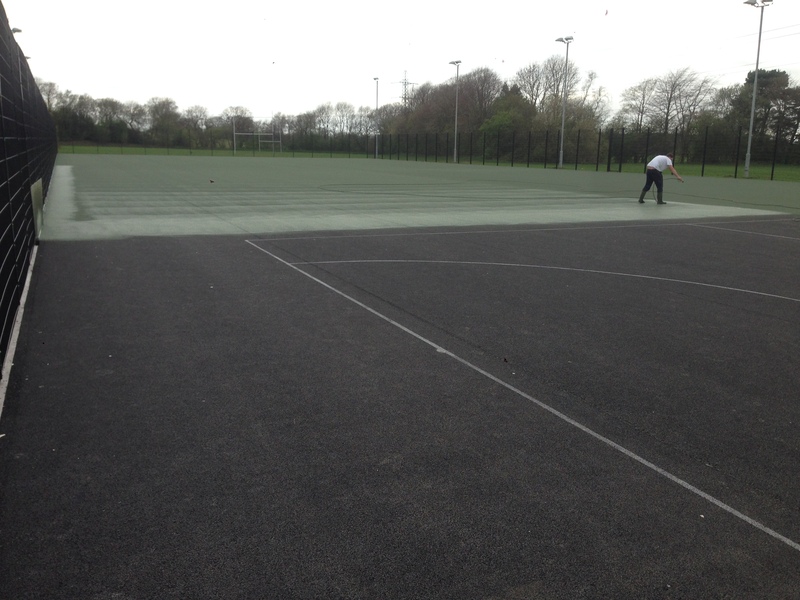 Macadam is a popular surface in schools for sports such as tennis and netball as well as general multi sports and activities as it’s very versatile. A coating of acrylic anti slip paint can be applied to the macadam surface to enhance slip resistance and create a colourful and attractive facility. Artificial Grass – 2G sand filled or sand dressed turf can be used during the construction to provide good playing characteristics for hockey to meet FIH standards, as well as for multipurpose activities including football and tennis. 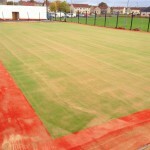 The 3G synthetic grass specification is a more suitable surface for football and rugby. Needlepunch synthetic surfacing can also be used as this is a fibre bonded carpet which is very versatile and is suitable for use with a number of activities. The application of anti slip paint coatings and contrasting line markings can be included as part of multi use games area construction. These applications help to enhance the performance and safety qualities of a MUGA facility and to easily distinguish between markings for each sport. These paint coatings can be applied in a range of bright colours so you can personalise your MUGA to suit school or team colours. 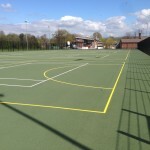 You can find more information about line markings for the polymeric surface specification by clicking here – https://www.sportsandsafetysurfaces.co.uk/surface-types/polymeric/line-marking/ which gives further details of the paint used and the designs we can apply for your MUGA court. A MUGA is a sports facility, also known as a multi use games area, which can be used for a number of different games and activities. These will usually have different coloured line markings which distinguish between the individual sports which are played on the surface. Many organisations like schools and leisure centres will have these as they make the outdoor space more efficient, and there is no need to have individual surfaces for each activity. If you are thinking of having a multipurpose area installed, please make sure you speak to one of our experts so we can give you a quote and talk you through all of the options. We’ll be able to create a bespoke design which suits your performance requirements and the budget you have available. Simple fill in our quick contact form with all the details so we can get back to you as soon as possible. 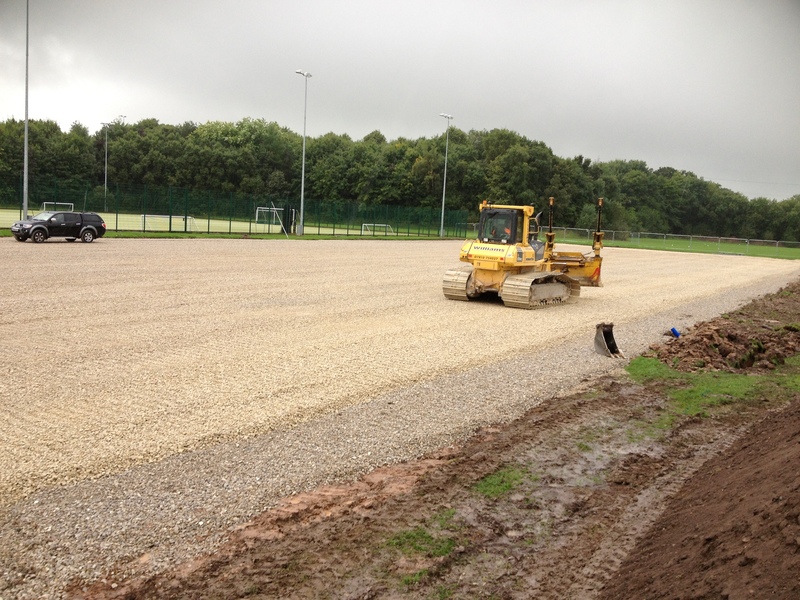 The costs involved with carrying out a multi use games area construction project can vary greatly depending on a number of factors such as the surfacing specification, area size and site location. We can help you keep costs down by managing other variables such as the extra equipment you choose to install, for example specialist floodlights and secure rebound fencing. Prices and quotes can be tailored to meet your individual budget requirements while still giving you the top quality multi use sports facility you need. Our aim is to give you a great value end product which will be safe for players and provide great performance characteristics for a long time. Making sure you regularly clean and maintain your MUGA sports facility will also help to reduce multi use games area construction costs. Proactive maintenance such as pressure washing, brushing and 3G pitch infill distribution can all help to maintain the performance and safety characteristics of the surface and prevent any damage or weathering as a result of heavy use. If your outdoor sport surface does become damaged, it is important to carry out reactive maintenance and repairs as soon as possible to prevent it getting worse and making the facility unsuitable for use. Keeping your sports pitch surfacing in top condition will reduce costs for your organisation and reduce the need for expensive repairs and resurfacing in the future. The video below shows a case study of a macadam court construction that we recently completed in Cheshire. 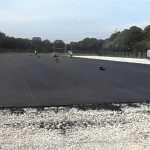 The installation process included full excavation of the ground, installation of a sub base and laying out the macadam surfacing itself. We also applied an acrylic anti slip paint coating in green with white and purple line markings for different sports. The macadam surface specification is common in the UK for schools and clubs as it provides a versatile and durable facility for a wide range of activities and multi sports in all weather conditions. We can also supply and install a range of other surface types and fencing options for multi use courts which can cater for a variety of sports depending on what you choose to play. Be sure to ask if you are interested in any of the extra features we provide and we’ll answer any questions. Take a look around the rest of our website if you’d like more information on building an all purpose MUGA court, or send us your details through our contact form. We would be happy to provide all the information you need along with a quote for multi use games area construction at your school or club. 2 What is a MUGA?